How Long Can Flour Be Stored in Mylar Bags? Flour can develop stale or unpleasant flavors after extended storage. 1 If Flour Has Never Been Opened Can It Still Go Bad? 3 Can You Use Musty Smelling Flour? Most kitchens contain a range of basic ingredients, some more perishable than others. For example eggs, dairy and meats must be kept in the refrigerator, while shelf-stable dry foods such as flour can be stored for extended periods in the pantry or a cupboard. Despite its durability, even flour will eventually become unusable in long storage. Its shelf life depends largely on how it's packaged for storage. For milling purposes, wheat kernels contain three main components. The outer covering of bran contains high levels of fiber and some oil; the germ contains oil, nutrients and some fiber; and the bulk of the grain -- called the endosperm -- is mostly starch and protein. The endosperm is the part that makes up white flour, while the oily germ and fibrous bran are retained in whole wheat flour. Artisanal stone-ground flours are manufactured differently, so even a white stone-ground flour contains both bran and germ. These differences affect how long the different flours last in storage. Conventional white flours, such as bread flour, all-purpose flour and unbleached flour, are all very similar in their storage qualities. In most climates they can be stored in their original bag at room temperature for six to eight months, and if they're enclosed in an airtight bag or storage container their usable life can be extended to a year or more. Over time -- especially in a warm, humid climate -- flour begins to develop a noticeably stale, "off" flavor. Once its flavor is affected, the flour should be discarded. Flour showing signs of insect or rodent pests should also be discarded because these pose a health hazard. Most other flours, including stoneground white flour, whole wheat flour and non-wheat flours such as rye flour, contain the grain's germ and bran. These contain most of the oils in the original kernels of grain, which pose a problem in long-term storage. Like any other fats those oils become rancid in time, giving the flour a distinctly unpleasant flavor. Stoneground and whole wheat flours are usually best within four to six months, though in hot climates they can develop unpleasant flavors even more quickly. Like white flours they benefit from airtight packaging, and are best kept in a cool place. Devoted bakers, who often keep several varieties of conventional and stoneground flour on hand, follow two techniques for minimizing spoilage. One option is buying only enough flour for a few months' use and replacing it regularly. The other is extending the shelf life of vulnerable flours by storing them in a refrigerator or freezer. Flour should be packaged in airtight bags or containers to prevent it absorbing flavors from the other foods in your fridge or freezer. 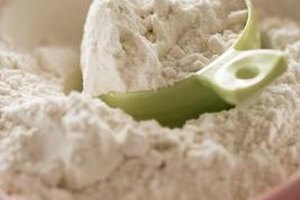 Refrigeration will extend the life of most flours by approximately 50 percent, and properly-sealed flour can be kept in a freezer indefinitely.